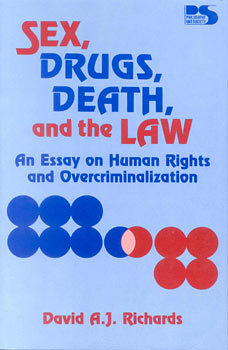 Among the most commonly argued legal questions are those involving victimless crimes--consensual adult sexual relations (including homosexuality and prostitution), the use of drugs, and the right to die. How can they be distinguished from proper crimes, and how can we, as citizens, judge the complex moral and legal issues that such questions entail? David Richards, a teacher of law in the areas of constitutional and criminal law, and a moral and legal philosopher concerned with the investigation of legal concepts, applies an interdisciplinary approach to the question of overciminalization. In examining the way in which American criminal justice has handled overciminalization, he draws on legal and philosophical arguments and links the subject to history, psychology, social science, and literature. To demonstrate how gross and unjust overcriminalization has developed, Processor Richards explores basic assumptions that often underlie the common American sense of proper criminalization. David A.J. Richards has practiced law in New York and is currently professor of law at New York University where he teaches constitutional law, criminal law, and jurisprudence. His prblications include A Theory of Reasons for Action (1971), The Moral Criticism of Law (1977), Toleration and the Constitution (1986), and numerous articles on law, philosophy, and political and moral theory.